Enjoy the freedom to charge the Qi devices, only need to take your Qi-enabled phone on the pad, then rapid inductive charging without the need to plug USB cable to your phone. Smart USB Ports Each automatically detects optimal charging speed for Android or iOS devices at up to 5V 2A, could charge your device very fast. Safe to use. Supports over-charged, over-discharged, over-voltage, over-current and short circuit protection perfectly protects your digital devices from charging accident. Easy to take with a protective storage bag in the package, very good Fast Charging Port For iPhone. 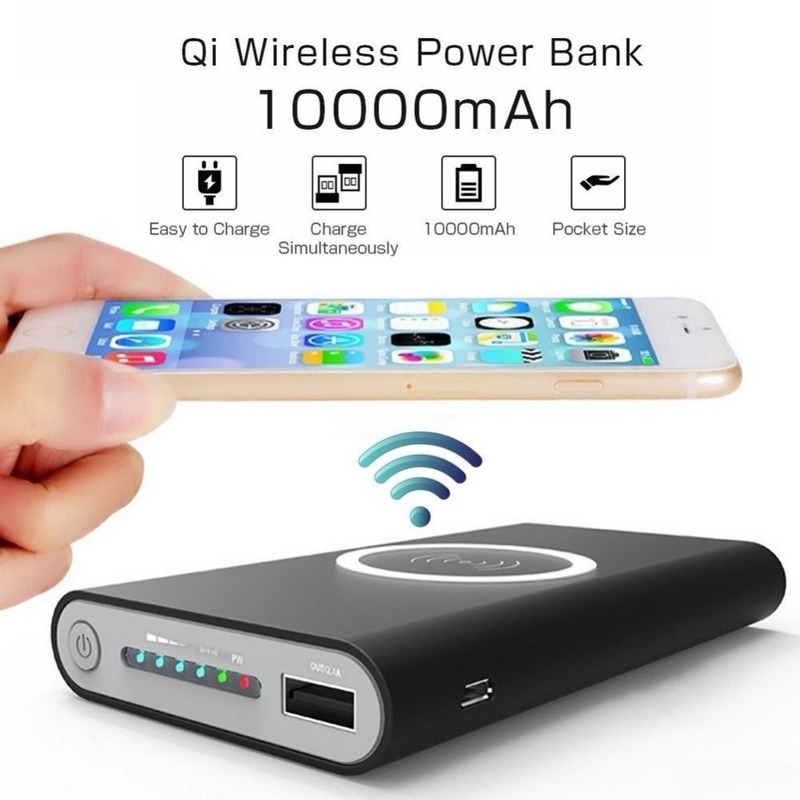 Qi Power Bank Charger Built-in a High-Power Qi Wireless Charging Transmitter and a Large-Capacity 10000mAh provides up to 3+ full charge cycles for smartphones Rechargeable Battery, wireless power bank has the ability for the pass-through charge, Allows you to charge your phone while charging your device. Wireless charging+ USB charge + Micro USB input + Type-C input. When Charging, the LED Indicator Will Remain Red, Blue When Charging, and Will Alternate Between Red and Blue When Your Device is Fully Charged. If the Connected Device is Not Charging Normally, the LED Indicator Will Flash Red. Use High-quality Batteries, the Charging Process is Not Hot, Over Charge, Over Heat and Short Circuit Protection to Ensure Safety for You and Your Devices, When Fully Charged, It Will Auto Stop Charging, Perfectly Protects Your Digital Devices From Charging Accident. 100% Satisfaction Guarantee, If you are not satisfied with your purchase for any reason, please feel free to contact us & we will satisfy you. Certified By FCC, CE, and RoHS for Quality and Safety! excellent as charging wireless and with wire. 100% give iphone 8 plus charge. Needs bit time to recharge but works perfect with iPhone X.... very good and quick communication with the seller! Just one week till Canary Island!!! Very fast delivery. Good product. It also work with an cover and 3x cards between. Arrived quickly. Looks like a good quality unit and the wifi charging works great.